Ma and Dad sent me a wonderful Easter surprise. My parents sent me a package. There were a couple of portuguese sausages, which I made sure to prepare for breakfast this Easter morning. The sweet smell of the sausage and the garlicky scent of my fried rice permeated my apartment. 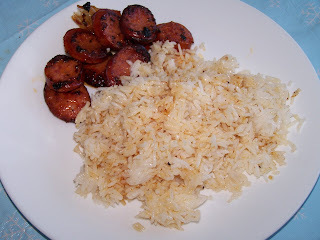 I felt so at home with the scent, as I often have this sausage for breakfast at home in Hawaii. Mom also filled the box with more favorites: Meiji Milk Chocolates, boxes of Milk and White Chocolate Covered Macadamia Nuts (Hawaiian Host). With all these sweets, I don't need to go Easter egg hunting. And of course, Mom knows her daughter's weakness - cute, writing papers. I miss Hawaii so much right now, and even if some relatives are proving difficult to deal with, I am so lucky to have wonderful, supportive parents. Mahalo. I am so happy I have you both in my life. Sounds like Hawaii is the place to be. Lucky you! Your parents are so sweet... I miss my Mom and Dad too. so lucky kayni! what a way to start the week! lucky you to have all those chocolates! wow! your parents are so sweet. they really know what will make you happy. I got a package, too, from my family yesterday. Full of Korean Squid and other stuff. How come they didn't send me Meijis? Heehee. I watched 50 First Dates last weekend and I'm so in love with the necessity to mention Mahalo. And spam and sausage are really part of Hawaiian breakfast. Have you been there in the cafe/resto where they did shoot the movie? I hope to visit that someday. care packages from family are the best, always brimming with love and happy thoughts. you're a lucky girl! unstranger, Hawaii is the love of my life =). wits, let's share my meiji bars =). actually, the Hukilau cafe used in the movie is a set. the real Hukilau cafe doesn't look like the one in the movie at all =). i've been to the Koolau Ranch where most of the scenes were shot. actually, a lot of movies were shot at the Koolau Ranch. Daphne, portuguese sausages are delicious. i couldn't find it anywhere else in the US aside from hawaii. oh that is so sweet :) and the contents of the package was really something to be happy about .. i love the papers too and i could just imagine how yummy those sausages and chocolates were :) lucky you having such thoughtful and caring parents. Toni, Hands up...the sausages and chocolates are super yummy...lol. i love sausages too.....yum yum, i can hear my tummy growling....kkk. That was very sweet of your parents. I haven't tried any portugese sausages but those look good. And the chocolotes, yum!!! mordsith, yes. once i saw the chocolate package with the Hawaiian lady, my mind went crazy thinking about the beach and palm trees. it's sweet torture. I'm craving a longganisa right now, and fried rice too! Ikaw talaga! Rico, that happens to me all the time, whenever i see a posting and photos of food, i start craving...lol.